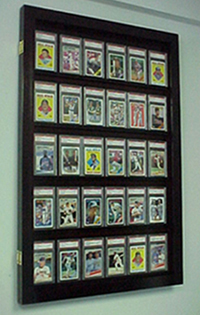 they have shelves the cards rest on and lean toward the acrylic for the best viewing. 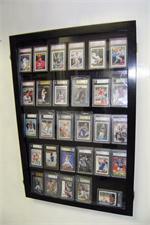 75 ungraded cards, we also do custom cases for cards and anything else you desire. 50 PSA Deep 2 brass Locks with Key 2 Wall mounts on the back Full 100% UV protection Framed in Acrylic Hinged Door 38" x 34.5" x 2 3/8th "Outside Dim. 36.5" x 33" x 1.5" Inside Dim. Between Shelves 5 15/16th" will hold cards 6" tall x 1 .25"
HOLDS 60-74 CARDS Hold Cards that are under 4 1/2" tall x 1 1/4" thick OUTSIDE DIMENSIONS ARE: 34 1/2" w X 39" h X 2 1/2" deep. INSIDE DIMENSIONS ARE: 33" w x 36 1/2" h x 1 1/2" deep. 20 Baseball card displays case will hold 20 ungraded baseball cards Glossy Black Holds that are under 4" tall x 1/2" thick. THIS CASE IS 18 X 22 X 3/4.